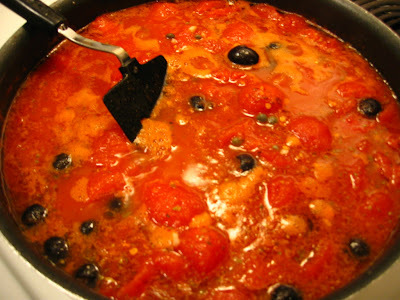 A well-made puttanesca sauce can be one of the most intensely flavorful of all the types of sauces in Italian cuisine. The recipe I have for you today is quick, inexpensive, and contains easy to find ingredients. The combination of olives, capers, garlic, hot pepper flakes and anchovies (don't panic! See below for more on this critical ingredient), makes for an unforgettable sauce. Best of all, you'll easily be able to make this dish in 20-25 minutes from start to finish. Of course this dish takes its name from uh, ladies of the night. Depending on whose history you prefer, either this was a dish prostitutes would offer to entice customers into brothels, or it was an easy and cheap meal that prostitutes could prepare between customers. Let's just leave that subject right there, shall we? Ever since my inappropriate discussion on stiffly beaten egg whites, I've been trying to keep this blog more G-rated. The entire dish should cost around $7-8 to make and it serves 5-6 easily. That may not quite qualify for laughably cheap, but it's pretty close. Furthermore, this is a dish that scales quite easily, so you can certainly double the recipe for larger dinner groups. One final comment on anchovies. If you don't like them, fear not. Laura can't even sit in the same room with an anchovy, yet she absolutely loves this dish. Do not leave them out. Then, add each of the other ingredients one by one as the sauce comes to a boil. Once you've added all the ingredients and the sauce is beginning to boil, turn down the heat to medium low. 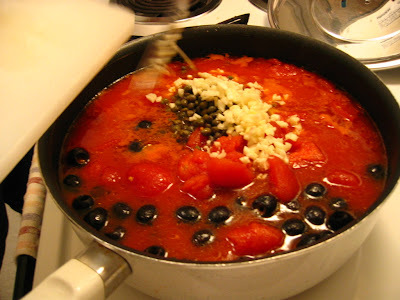 Let the sauce simmer and thicken for 10-15 minutes, stirring occasionally, while you cook the pasta. 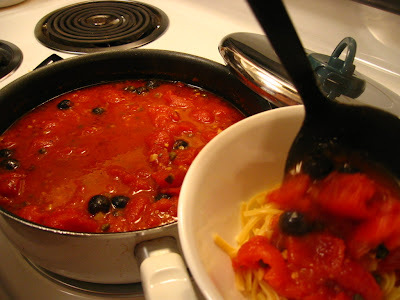 Ladle sauce liberally onto pasta and serve immediately! First, let's take a quick look at a photo of all the ingredients you'll need. Notice the seemingly extraneous glass of wine. 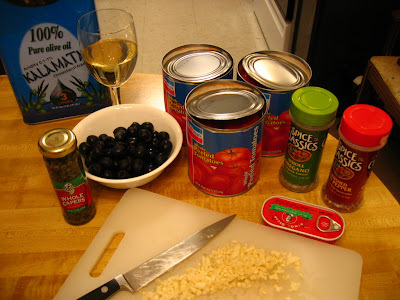 Although this recipe doesn't include wine as a specific ingredient, we have seen before that a glass of wine serves critical functions for the chef, both as an analgesic and a mood-lifter. 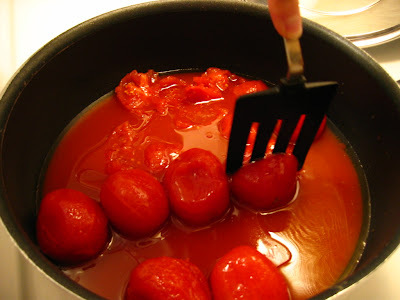 Use the spatula to break up the tomatoes into coarse chunks. You'll probably want to at least quarter every tomato, even the smaller ones. Proceed carefully with this part of the recipe, and do not wear white. 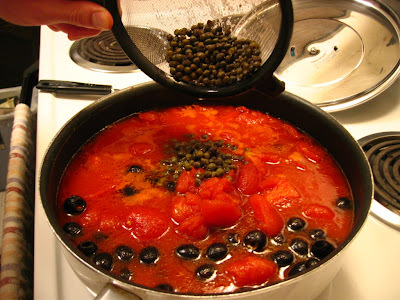 I usually pour the capers into a small strainer and then run cold water over theme to rinse them. After that, you can drop the little guys straight into the pan. Add each of the other ingredients one by one. In goes the garlic! 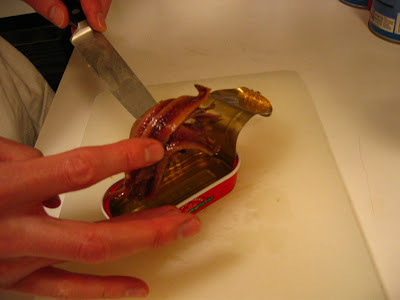 If you either loathe or fear anchovies, or if they gross you out in any way, skip the next two pictures. But DO NOT LEAVE THEM OUT OF THIS RECIPE. They are an absolutely critical element of the overall flavor of the sauce. Remember, even though Laura claims she cannot sit in the same room with an anchovy, she still loves this dish. 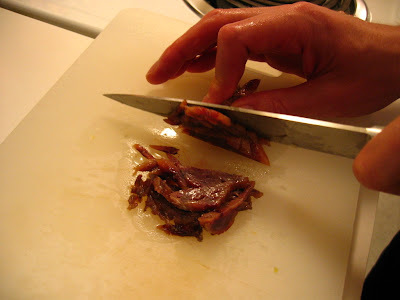 Chop up the anchovies into smallish pieces, maybe the size of an aspirin tablet or smaller. You'll want them to disintegrate in the boiling sauce. 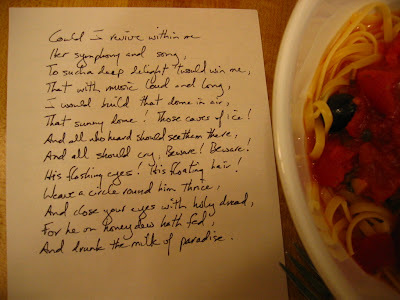 Ladle onto your pasta. A wide/flat pasta like linguine or fettucine works well for this dish, but honestly any type of pasta is fine. Literacy alert! I'll give away a free gift subscription to Casual Kitchen for any person who leaves a comment naming the author and poem that's excerpted in the picture above. :) Good luck! Looks like a great recipe, by the way. First you liberated the lowly beet from the dirt-floor of the Slavic cellar; now you have raised from the depths the anchovy and brought it to it's rightful status as mini wonder-food, the miracle of Amalfi, the fishy flavor-bomb, a sort of natural MSG from the ocean. I often slip anchovies in to sauces and braised dishes and have sometimes had to hide the can so as not to turn off some who know not what they fear. I usually add half to the dish and eat the other half from the can on bread, washed down with a beer. this is only for those who "really" love anchovies. I have noticed in the past few years that fresh anchovies have made a comeback on some menus, particular at spanish tapas and italian restaurants. When they are fresh they are stunningly good. For a more traditional Napolitan or Amalfitan anchovy experience, order an anchovy pizza at Patsy's in East harlem or Pepe's in New Haven. So true about people "knowing not what they fear." So true. And I've been known to sneak a few anchovies myself. Just made this tonight and it's spectacular! I didn't know what I'd do with the remainder anchovies, so minced them fine and threw them all in. They added an elusive and savory flavor, but I couldn't see them in the finished sauce. I'm trying not to go into the kitchen and drink the rest of the sauce. Thanks for your comment Alphacyg! I've been tempted to drink this sauce on occasion too. It is that good. Thanks for reading! never used a caper before, are you supposed to cut them in anyway or just chuck 'em in whole? Mr.Physix, Just chuck 'em in whole. At least that´s what I do. No need to cut them up. This looks so good! We're not big fans of large cooked tomato hunks in things so I will probably use diced tomatoes, but I'm definitely going to try it soon. I've always wanted to make puttanesca. Great recipe! 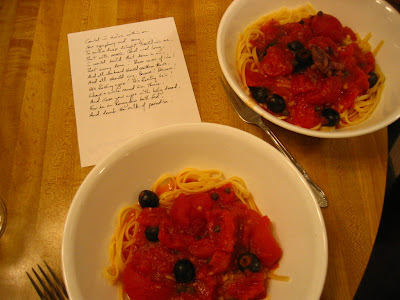 Puttanesca sauce is a favorite of mine and I will definitely bookmark this page...I love this colorful, chunky, tasty sauce on my pasta. Kaija, interesting and creative ingredient substitution idea! Thanks for sharing.